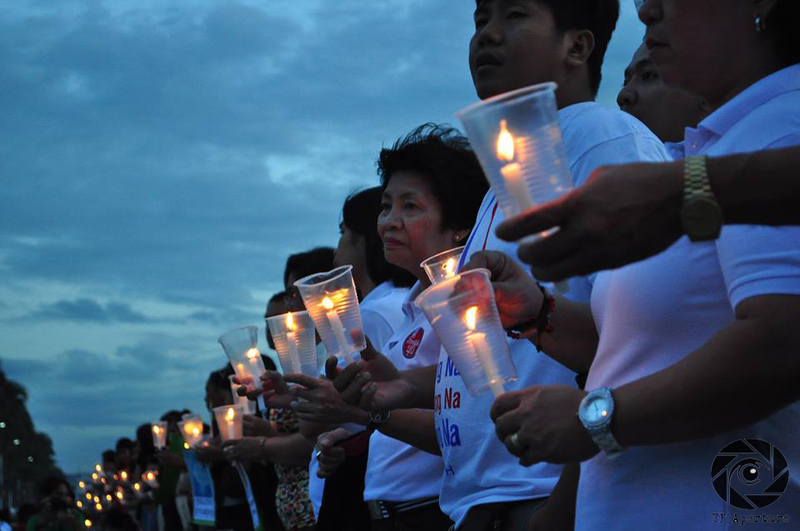 Members of media and student groups formed a human chain along Roxas Boulevard to call for justice a day before the fourth year anniversary of the Maguindanao Massacre. The National Union of Journalists of the Philippines (NUJP) led the protest in commemoration of the said case’s fourth year in court together with the victims’ relatives, and other media and student organizations. “Sana naman hindi na ito umabot ng ikalimang taon at may makita tayong magandang resulta sa paggulong ng hustisya ukol sa isyu na ito (I hope this case will not reach its fifth year. I hope we will see justice being served),” said political activist Mae Paner, also known as Juana Change. On November 23, 2009, 58 people were killed in an election-related incident in Maguindanao. Of these, 32 were journalists. They were en route to the Commission on Elections provincial office for the filing of the candidacy of then Buluan Vice-Mayor Esmael Mangudadatu, when armed men, allegedly working for the Ampatuans, ambushed and killed them. “Ngayon, under PNoy, 18 na ang pinatay na journalist based on the documentation of NUJP. Pinapakita lamang nito na sa Pilipinas, pwede kang pumatay ng 58 na tao and you can get away with it (Under President Aquino, 18 journalists have been killed, according to NUJP’s documentations. This only shows that here in the Philippines, one may slaughter 58 people and he/she can get away with it),” she said. Paraan also appealed to the people to keep an eye on the continued media and activist killings which remain unresolved. The protest started with a prayer-ritual, followed by brief speeches from participating group representatives.The participants lighted candles and offered prayers for the victims of the Massacre on Friday. Before heading to Roxas Boulevard, the College of Mass Communication (CMC) community gathered to commemorate the massacre at the newly-inaugurated Freedom of Information Garden. in commemorating the Ampatuan Massacre is evident. It is because of the more pressing issues the country is facing, like the relief and rebuilding operations after Super Typhoon Yolanda that even took out the remainder from the earthquake that hit Bohol and Cebu and Typhoon Santi that buffeted Central Luzon),” Dean Roland Tolentino said in a statement. Different CMC organizations showed their support in the fight against the culture of impunity, against continued media killings and for the campaign to “never forget.” They also condemned the slow progress of the massacre trial in their statements. Vigil participants then marched around the Academic Oval with members of the CMC faculty and staff. A separate program was held at Mendiola on Saturday, where various groups tagged President Benigno Simeon Aquino III as “Impunity King” for the lack of government response to speed up the trial. Red ribbons bearing the names of the victims were also pinned near the Mendiola gates. This article was first published in TNP’s Nov. 26, 2013 print issue.